Christopher A. Tuttle is an archaeologist whose research focuses on the Hellenistic and Roman periods in the Middle East. His specialization is the ancient kingdom of the Nabataeans and their capital city of Petra, where his fieldwork has been centred for nearly 20 years. He holds a BA in Classical and Medieval Studies from the University of Massachusetts, Boston and a PhD from the Joukowsky Institute for Archaeology and the Ancient World at Brown University. Chris lived and worked full-time in the Middle East for nearly 15 years, first in Jerusalem and then in the Hashemite Kingdom of Jordan. Initially interested in ancient mystery cults from the Classical, Hellenistic, and Roman periods and heretical movements in Medieval Europe, Christopher shifted his area of research to the Middle East to explore the period of transition between the end of the independent Hellenistic kingdoms and the rise of Roman hegemony in Syria and the Levantine region. His doctoral work focused on the Nabataeans at Petra, who were the last independent kingdom in the area to be absorbed by the Romans. Christopher has travelled extensively in the Middle East to explore important archaeological sites from all periods of the region’s long history and has worked on a number of excavations and surveys, including in Israel/Palestine, Qumran, Ramat Hanadiv, Khirbet Jiljil, Jerusalem, Tzuba, Sepphoris, Mizpe Ramon, Mampsis, and Sobeita. In Jordan, he worked briefly with the French at Khirbet es-Samra before focusing on Petra and its hinterlands; his excavation, survey, and conservation projects there include work on some of the major monuments, including the “Great Temple,” Petra Church, “Upper Market,” “Garden and Pool Complex,” the “Monumental Platform,” and the “Temple of the Winged Lions,” where he envisioned and launched the Temple of the Winged Lions Cultural Resource Management Initiative (TWLCRM), an award-winning and innovative grassroots project that pioneered a new model for the involvement and training of local people in the preservation and management of cultural heritage resources that affect their lives. He also co-directed the Brown University Petra Archaeological Project, which conducted the most-extensive landscape survey to date in the northern Petra hinterlands, including the area of Beida (a.k.a. “Little Petra”), with its important remains from earliest prehistory through to the modern day. He has also assisted and advised on many other archaeological and cultural resource management projects throughout the Hashemite kingdom of Jordan, as well as in Syria, Iraq, Saudi Arabia, as well as in Egypt and other North African countries. 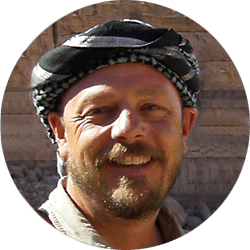 He is currently the field director for the groundwork team surveying around Hegra (Mada’in Saleh), an archaeological site located in the Al Madinah Region of Saudi Arabia, whose remains mainly date from the Nabataean kingdom. He was the Associate Director of the American Center of Oriental Research (ACOR) in Amman, Jordan from 2006–2014, during which time he directed field projects in Petra and assisted numerous other archaeological missions in the region. During his time based in Amman, he frequently guided archaeology tours of sites in Jordan including ASA’s tour to Jordan in 2009 and 2010. He then served for three years as the Executive Director of the Council of American Overseas Research Centers (CAORC) based in Washington, D.C.
Chris will be returning to ASA in 2020 to lead our tours to Jordan, Southern Turkey and Tunisia.